My outdoor market season ended Sunday with the Oak Grove School Hibernation Festival. No one wanted to hibernate, though, since the weather was gorgeous and we all enjoyed a lovely day out in the sun. Now it's on to the holiday craft fairs. My first one is this weekend at St. Peter Claver Church in West Hartford. All proceeds the church takes in go to support their medical mission to Haiti, and I'm thrilled to be able to help out in this. Here are a few recent additions . 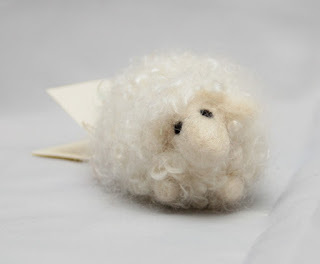 A sheep made with curly fleece from Kelly Radding's flock. 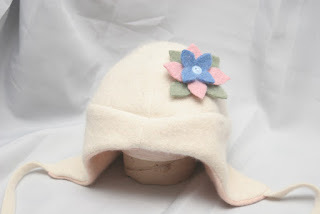 A lambswool and angora hat for a little girl. 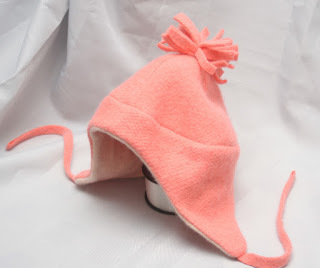 And some more hats. 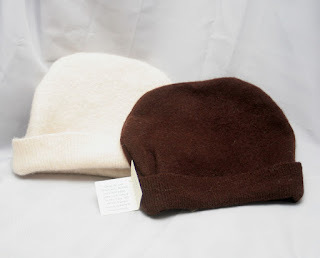 The cuffed ones are adult size, and the brown one is cashmere. The white one with the flower is a baby/toddler size. Now that I'm working out of the house just on the weekends, I hope to be able to keep up more with the blogging. Hope to see some of you at a fair!